Self-proclaimed lover of Brussels sprouts right here. But, I’ll admit, I pretty much always roast them. Because, um, they’re awesome that way. But our virtual bud Heather Crobsy of YumUniverse (you may remember her from this super-cute and yummy Halloween recipe) has me broadening my Brussels-sprouts horizons with this recipe from her new vegan cookbook, YumUniverse: Infinite Possibilities for a Gluten-Free, Plant-Powerful, Whole Food Lifestyle. Using shredded Brussels sprouts (plus kale!) and lots of rich Asian flavors, this is the kind of dish that’ll have you wondering: Why haven’t I made shredded Brussels sprouts sooner? (At least I was.) Genius! One of my favorite quick-and-easy meals that doesn’t taste quick and easy. I often use this recipe as a base and toss in other goodies I have on hand for the week, like carrots, chickpeas, and zucchini. Wash and slice Brussels sprouts into strips with chef’s knife. If you have a food processor, save time by running your sprouts through the shredder blade. Place them in large glass bowl. Roll up kale leaves lengthwise and chiffonade into thin strips. Slice onion and set aside. In a small bowl, mix together sauce ingredients. Set aside. Heat skillet to medium-high and then add oil. Place sliced onion, shredded kale, and Brussels sprouts into pan. Sear veggies for 2 to 3 minutes and then stir. Sear another 3 minutes and then stir. Repeat one more time and remove from heat. Fold in sauce, top with sesame seeds and pepper. 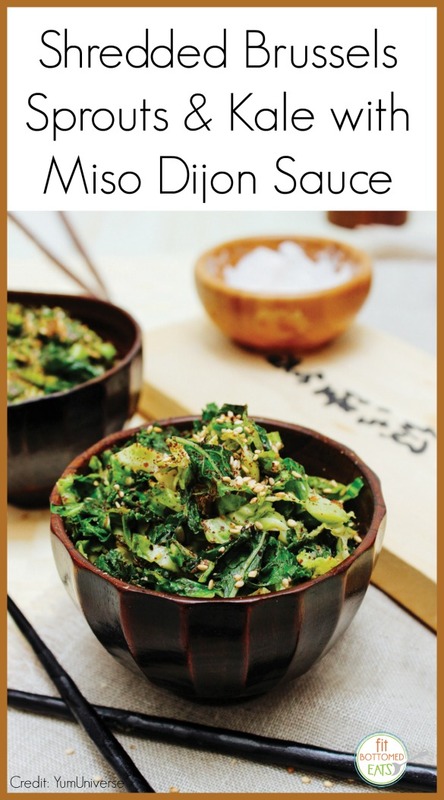 (You can add salt, but you probably won’t need it thanks to the saltiness of the miso.) Serve warm. *Psst! Add shredded carrots and/or toasted walnuts to the mix. *Any light, soy-free, gluten-free miso will do. *Serve with cooked brown rice, quinoa or buckwheat.